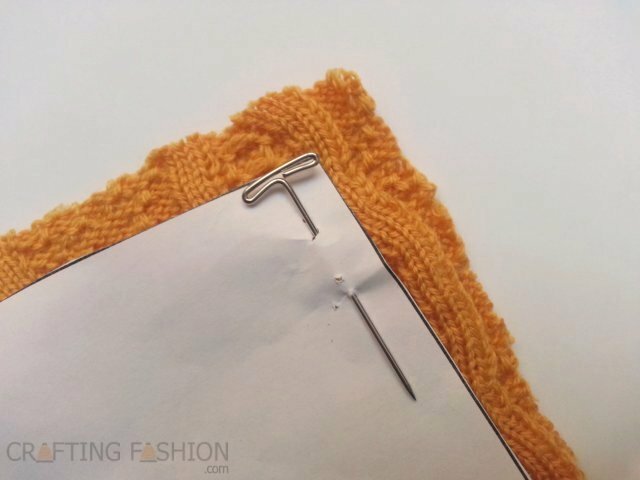 For sewists who also knit, this is often the step that fills them with dread -- cutting! There are false rumors online (and probably elsewhere) about knit fabrics not fraying or running. As knitters know, this simply is not true for the knit fabric of sweater weight. But there is no need to fear cutting a sweater knit fabric either. 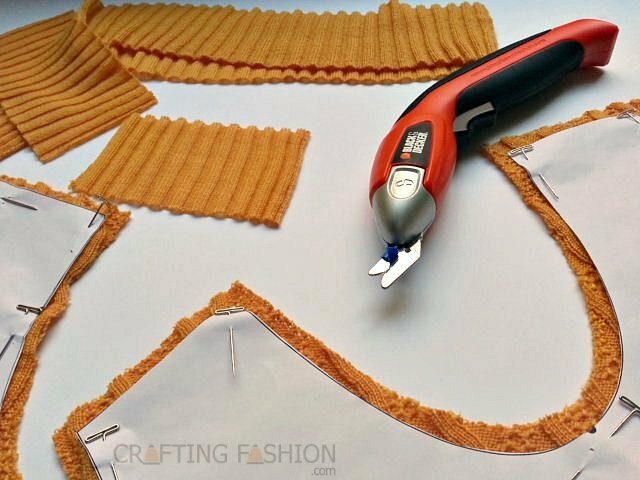 If you prepare the fabric, use sharp blades, and refrain from overstretching the cut edge, you won't have a problem. Really! My scissors of preference are pictured above. Last summer when I first came across the scissors, I couldn't wait to share them, but a lot has happened since then. Namely, the price has gone up. And down. And then back up again. Way up. One afternoon, before purchasing these wonders and after a session of cutting through a heavy rib knit, the joints in my thumb and fingers were sore. I decided to do a little research on rotary blades. (It seems that cutting knits with rotary blades is highly recommended by some people. Funny. Cutting knit fabric doesn't scare me. Rotary blades do.) A subsequent Google search for electric scissors eventually brought me to a YouTube video where I watched a man, Brian of briansews.com, use the Black & Decker Power Scissors. Here's that video, and I've cued it to the part where he starts talking about the scissors. See Brian power cut through heavy denim. I hope you've watched and enjoyed Brian's video. I thought it was pretty amazing stuff, and I bought the power scissors. Let me tell you, when it comes to sweater knit fabrics, the B&D Power Scissors are a dream come true! They are lightweight, safe and easy to maneuver, and the cut they make is clean and accurate. The price was pretty cool too. I paid $21 plus shipping when I purchased the B&D Power Scissors through Amazon last summer from a store about 50 miles away from me. None of my local hardware stores carried them at the time. See? Even up close, the edges are sharp. Now here's the problem. If you roll your mouse over the Power Scissors listed in The Book & The Tools in the right sidebar, depending on when you read this, you'll see a very different price -- $69 as I write this! I've observed the price fluctuate between $20 and $78 in the last 5 months or so. That's a pretty big range. And I now see the same scissors (SZ360) in blue or pink priced at $85! While I can highly recommend the scissors at $21 or even $35, I do have reservations at $78, especially when it's a price increase of almost 400% in just a few months. Though I do like a solid tool, frankly I prefer to spend my dollars on luxurious yarns and luxurious fabrics. If your hand aches after a session of cutting and if having a rotary blade in the vicinity of your hand scares you, these power scissors are the way to go. Though I have not heard good things about the electric scissors branded as Zippy or Singer, the Crafty Gemini gives a very convincing demonstration of the Simplicity Electric Scissors, which are currently available at under $40 . The really good news is that my local hardware store now carries the Black and Decker Power Scissors. The price? $25! Your local hardware store may have them, too. Just be sure to keep an eye on the volatile Power Scissors market and check your local hardware store first. I want those scissors! What a great idea! This is really interesting - i tend to be in the rotary cutter group, and to be honest I've never even considered power scissors. But if they really are that good i'm very very tempted! I always get injuries from my rotary cutters (clumsy me), so these might be a nicer solution :) thanks for the review!! My pleasure! All the best! I paid 5 dollars per pair (I have 2) at walmart when they were selling out. But then big lots had them or 15. That was last year some time. oops, make that for 15...sorry.